Man With a Plan is an American 30 minute scripted family television series, which kicked off on October 24, 2016, on CBS and is broadcast every Monday at 20:30. The show is currently in its 3th season. CBS is yet to announce the renewal of Man With a Plan for Season 4 as well as its cancelation. Sign up to track down the show's status and its release date. 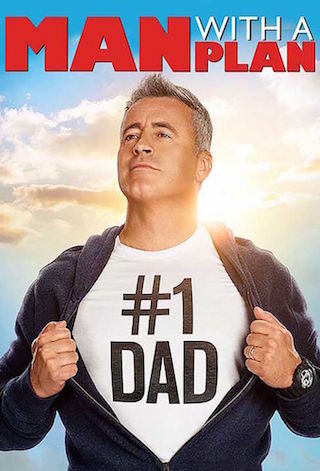 Man With a Plan is a comedy about an old-school guy confronting the modern challenges of parenting, marriage, and family. Adam's self-assured wife, Andi, has gone back to work, forcing him to deal with the startling discovery that his three school-age "little angels" are maniacs, all the while trying to run a contracting business with his troublemaker brother, Don. In the midst of all this, Adam also has to deal with his strong-willed and opinionated father, Joe, who enjoys giving him terrible advice about how to run his life. With Andi's encouragement, and help from an unlikely friend Lowell, Adam takes charge of his brood, lays down the law, and discovers he's going to "nail" this job. Adam recruits Marcy to put Andi's snooty sister, Kelly, in her place when she comes for a visit. When Adam and Andi see how much Lowell's new relationship with Andi's sister, Kelly, is changing him, they stage an intervention to get him to stop putting up with her bad behavior.